On Sunday 7th of October, the Brazilian people will go to the polls to elect their next president. There has never been such a dramatic election since January 15th 1985 when Brazil returned, the vote to the polls after twenty years of dictatorship (1964-1985) – although voting took place still within the electoral college system put in place during the dictatorship. Following the impeachment of President Dilma Rousseff two years ago (which Saad-Filho described as a “coup”) and a chaotic interregnum led by the corrupted Michel Temer (PMDB) – who nonetheless was very effective in curbing workers’ rights by amending part of the famously pro-labour Labour Law (CLT), regularizing outsourcing and cutting workers’ pensions – the future of Brazilian democracy hangs in the balance. Much of it will be decided at the polls. 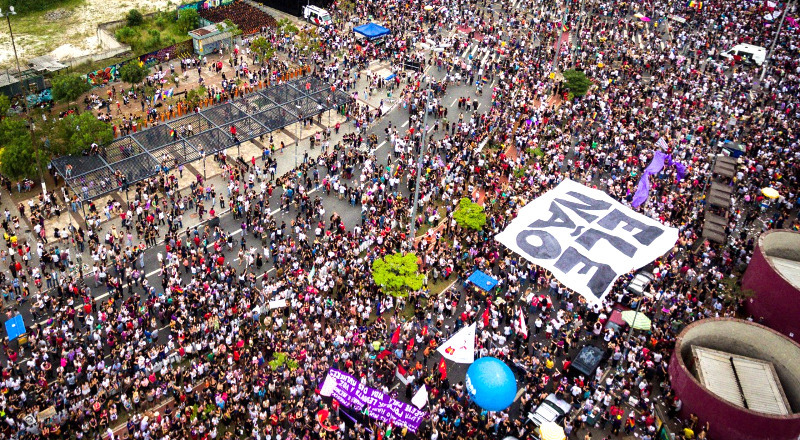 Thousand of people demonstrate against the Brazilian presidental candidate Jair Bolsonaro in Sao Paulo, Brazil. Leading with 32 per cent of vote intentions (Datafolha) is Jair Bolsonaro (PSL), a right-wing populist and evangelical Christian who is brilliantly taking advantage of the popular rage exploded against the political establishment after the Lava Jato (Car Wash) investigation which led to the imprisonment of the ex-leader of the PT Lula da Silva and the impeachment of Dilma, although on unrelated charges. Trailing behind him with 21% of is the candidate for the Workers’ Party (PT) Fernando Haddad. 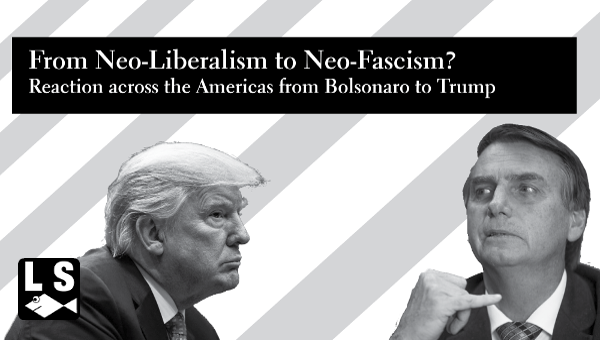 It’s easy to dismiss the Bolsonaro trend, as a form of “tropical Trumpism” ( The Guardian , 6th of September) (recently Bolsonaro’s son boasted that Steve Bannon is their political consultant) and to point out the vast array of anti-Bolsonaro demonstrations sweeping across the country. 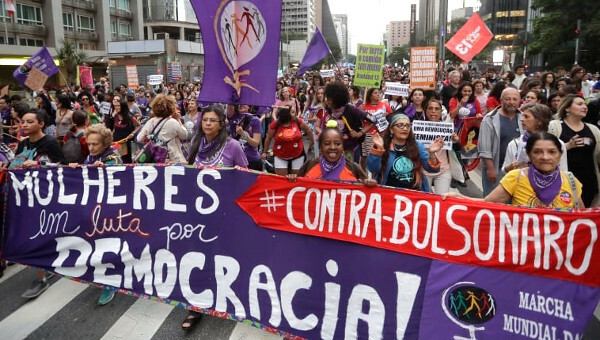 Mirroring the anti-Trump women marches in the U.S. and abroad, millions of Brazilian women have joined an anti-Bolsonaro Facebook group and organized a very successful social media campaign, supported by Brazil’s top female singers, with the hashtag #EleNão (#NotHim). But Bolsonaro’s new ground among poor constituencies is worrying. The big electoral swing in support of Bolsonaro happened only a few days ago, when the bishop of the ultra-powerful evangelical Universal Church of God, Edir Macedo, declared his support for him. Among the poorer evangelical constituencies Bolsonaro has 40% of intention of vote. A supporter of Cardoso in the 1998 elections, Macedo shifted his support to Lula in 2002, which allowed him to woo poor evangelical urban voters at the time suspicious of Lula’s left-wing liberalism – especially his take on abortion. This week Macedo and Jose Wellington Bazerra da Costa, the president of the Congregation of all Universal Church of God in Brazil openly declared their opposition to Haddad, exacerbated by the gathering momentum of the #EleNão (#NotHim) campaign. This development is pulling a big section of that vast Brazilian urban lumpen proletariat – the informal and illegal workers, unemployed or ‘criminals’ living in the shantytowns of big cities – away from the PT. Lula da Silva, the self-declared ‘friend of the people” and “ex-poor”, had captured the loyalty of such marginal strata with generous programmes of poverty reduction, popular housing and the democratization of credit. Now the support among women and black – the grassroot force of evangelical churches) toward the PT is rapidly dwindling. For the first time in years, favelas are breeding their own right-wing candidates (Folha De Sao Paulo). It turns out that if middle-class women tend to back Haddad, the vast majority of women from poor background support Bolsonaro and on the whole more women than men support him (53% of women and 47% of men according to Valor Economico , 3rd October). The second important form of empowerment for Bolsonaro came from the endorsement of Nabhan Garcia, the president of the Ruralist Democratic Union (Uniao Democratica Ruralista – UDR) and of the all-powerful Agro-pecuniary Parliamentary Front (Frente Parlamentar de Agropecuaria – FPA) that counts 261 MPs – 40% of the Congress. With Bolsonaro President and Garcia Minister of Agriculture, the government will pay homage to the powerful rural oligarchy and possibly also lure in Brazil’s rural masses which allowed Dilma to be re-elected with a strict margin in 2014 but were subsequently alienated by her austerity measures and the Car Wash corruption scandal. Bolsonaro is also making inroad into the bastions of rural support to Dilma in 2014 that is, into Brazil’s northern and north-eastern regions, where respectively 25.8% and 28.4% were recipient of the Bolsa Familia in 2017. If Bolsonaro becomes president, some Ministries will be run by generals. But his support in congress will be weak and he will not be able to impose any authoritarian rule. But there is a general feeling that at least on the cultural level, the dictatorship is coming back – whitewashed and bourgeoisified for popular consumption. And this is both ironical and tragic, in the light of the immense impact of the publication of a damming report on the atrocities committed under military rule in Brazil, back in 2014 when it was revealed that President Dilma herself had been persistently tortured. Signs of such comeback are all around. This week, the president of the supreme court (STF) Dias Toffoli, turned down the request by two journalists to interview the ex-president Lula da Silva in his cell in Curitiba, by appealing to a Press Law created in 1967 during dictatorship. On the 2th of October, at a symposium on the 1988 constitution organized by the prestigious Law Department of USP, lawyers and scholars were taken aback in hearing Toffoli describing the 1964 coup as a right-wing “social movement” coexisting with equally pernicious left-wing organizations. Indeed, for the famous historian Boris Fausto – who survived Getulio Vargas’ Estado Novo and the military regime to become one of the world’s leading dependent development theorists – the other dark force lurking behind Bolsonaro’s authoritarianism is the authoritarianism of the Workers’ Party (PT), incarnated in the phenomenon of Lulismo. ( Valor Economico , 2nd October). What about the PT and Lulismo? What went wrong? Soon after being elected president in 2002 Ignazio Lula da Silva, an ex-metalworker from the ABC industrial belt and leader of the Workers’ Party (PT), set up the massive programme of poverty reduction Bolsa Familia which today reaches 13 million families – one-quarter of the national population. As a result of the Bolsa Familia the population below the poverty line decreased from 36% in 2003 to 23% in 2008. With a buoyant global commodity market Lula managed to combine pro-labour policies – such as a stunning 50 per cent increase of the minimum wage; cheap credit and subsidized working-class housing – and exorbitant interest rates and currency overvaluation. Lula’s pro-labour and pro-finance policies alienated the industrialists, whom nonetheless had not enough political clout to catalyse anti-governmental forces. In the second mandate, Lula cut welfare expenses and deregulated the labour market, which radically increased casualised work. Seeing their nominal wages increase, wage-workers turned to cheap credit to finance their new conspicuous consumption. With the end of the commodity boom the compass between financial profit and social redistribution became unsustainable. The industrialists and the financial and banking oligarchies now joined forces against the government. Advised by ministry of finance Joaquim Levy, a Chicago trained economist, Rousseff radically cut social spending and credit, privatized state assets and put together the proposal for Lei 4330 , which if approved, will radically deregulate Brazil’s labour relations system. According to Perry Anderson (2016) the PT’s sudden fall from grace is due to the electorate feeling ‘cheated’ by Dilma suddenly embracing right-wing austerity policies. On a basic level, Lulismo is simply the outcome of the charismatic leadership of Lula Da Silva, who was able to combine the diverse ‘moralities’ of grassroot catholic organizations, socialism and business-like pragmatism, and in so doing, capture diverse social constituencies – from the urban and rural poor to the financial and banking elites and the rural oligarchies – and in the process, alienating the grassroot constituencies that propelled the PT to power and the very base of the PT. 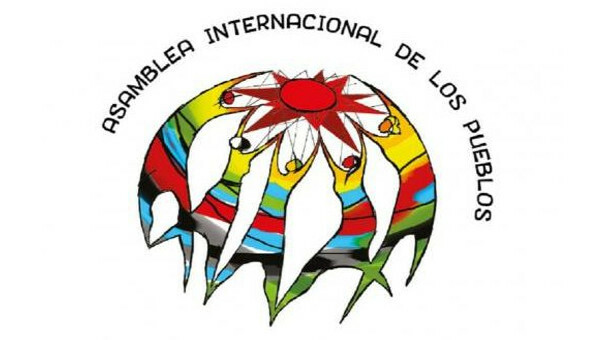 Or Lulismo can be seen be seen as part of a wider neo-extactivist consensus (Svampa, 2013) through which Latin-American left-wing parties in power combined financial speculation, commodity extraction and radical programmes of poverty reduction. Lulismo can also be interpreted as a failed “social neo-developmentalism” (Singer, 2016) whereby the Brazilian state morphed form being an agent of social redistribution to becoming the main force of capitalist expansion. Sociologist Ruy Braga describes Lulismo as the combination of the passive incorporation of the marginal working-class and the active incorporation of the top echelon of the trade-union strata who becoming pensions fund manager, “financialized themselves” and turned into a new state bourgeoisie. Besides, according to Braga, central to Lulismo is a schizophrenic attitude toward the working class, visible in the PT’s opposite economic policies of reduction of job precariousness and increase of formal employment for marginal constituencies especially poor black, young and women, and on the other hand, of mass tertiarization and flexibilization of productive activities leading to the massive increase labour turnover and work accidents and the sharp curtailment of social rights. (Braga 2016). Or lastly, Lulismo can be seen as a variant of past presidentialist regimes, typically Vargas’ Estado Novo, whereby the failure of the bourgeois counter-revolution – the social contract between urban masses and urban bourgeoisie – (Fernandes) put democracy under constant threat by the dominant ancient oligarchies, and was kept alive through personal deals presidentes made across the political spectrum and with the logistical support of strong authoritarian bureaucracies. Against the baroque equations of social neo-developmentalism, Paulo Guedes, Bolsonaro’s main economic adviser (who was educated at the University of Chicago) proposes simple recipes: free-market, extensive privatizations and further curbing of labour rights. 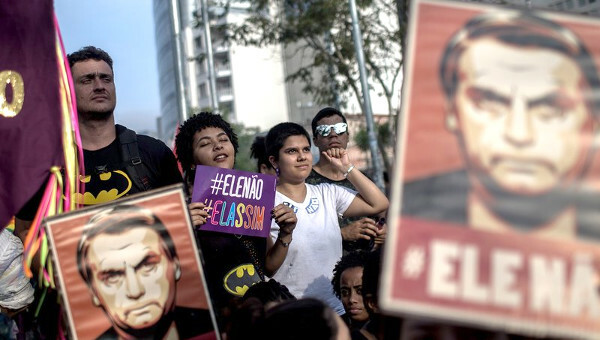 Such Chicago style manifesto wooed the big capital and the financial sectors that, as the centrist candidate Geraldo Alckmin (PMDB) loses steam, are turning their support to Bolsonaro. But these recipes are unlikely to appeal to the urban precariat or the rural dispossessed or the unionized wage workers whom the election results ultimately rest on. Indeed, the 2013 June uprising – a series of anti-government which paralyzed the country – saw the re-articulation of the urban precariat and unionized workers around a newly radicalized Left, which included the Socialist Party (PSOL); the new trade union, the Homeless Movement (MTST) and a vast section of the radicalized youth. This essay also published on Focaal Blog. Massimiliano (Mao) Mollona is a writer, filmmaker and anthropologist. He is a Senior Lecturer at Goldsmiths College, University of London.